The Ridge at Snowmass Village. Ski in and ski out access, views, privacy!! You'll enjoy an unforgettable retreat to a mountain condo that has ski-in ski-out while offering a private mountain feel with great proximity to all that the resort has to offer. All vacation condos have covered parking, wireless internet, and access to a wonderful outdoor pool and spa. The Ridge is the perfect place to stay while visiting the Aspen / Snowmass area. Snowmass Village is a stones throw from the property and Aspen is just a 10 minute drive. The Ridge is surrounded by amazing scenery and awesome activities during every season of the year. Skiing, hiking, biking, golf, rafting, horseback riding, dining, and shopping are all just outside the door. Stay here while you play here. The Ridge offers outstanding two and three bedroom condos all year long. 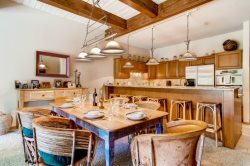 Looking to purchase your very own vacation condo here in Snowmass? From time to time owners want to make changes and sell. For more Real Estate information Snowmass Select Team.